Calista Kanmany Williams was born in Puloly, lived in London and passed away peacefully on Wednesday 10th April 2019. 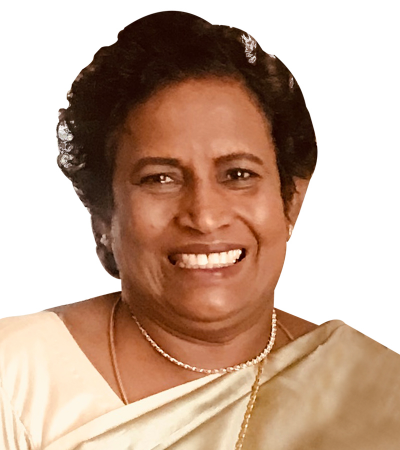 She is the Loving Daughter of the late Anthonypillai Philips (Headmaster of St Theresa’s School Kilinochchi) and the late Francesca Muthamma, Daughter in law of the late Chelliah F William(P.W.D Overseer Illavalai) and the late Mary Anpurani William. Beloved wife of Camillas Vijayakumar. Doting sister of the late David Anthony(Ponrasa), George Mariathas, Soosaithasan (Sellam), Christopher(Palar), Grace(Thangamany) and Benjamin Thangaras Survived by Poomani, Rev. Fr Emmanuel Jesuthasan, Elsie(Rukku), John(Navam) and Thevathas. Loving sister in law of the late Rosemary, Celine, Joachim, Rani, Elizabeth, Anthony, Miriam, Vathy, Reeni and Malini Rajanayagam, Rosemary Chellar, Yogini Francis, Sampson William, Rita Nalini Dyonisius, Sarogini Balaratnam, Shanthini Ignatius, the late Ashokumar William, Rathini Ganesharatnam and Subothini Rajmohan. OUR HEARTFELT SYMPATHIES. MAY SHE ENJOY THE ETERNAL BLISS. Our heartfelt condolences to your family. May her soul rest in peace. Please accept our heartfelt condolences. May her soul rest in peace. Our prayers and thoughts are with you all. Your trust in God will guide you through this difficult time. Please accept our heartfelt condolences. Rest in peace. Our deepest condolences to Wijayakumar,Natasha and other family her soul rest in peace.